More than seven in 10 South Koreans and two in 10 Japanese think a 2015 bilateral agreement on compensation for the Korean victims of Japan's wartime sexual slavery should be renegotiated, according to a survey released Thursday. The poll was jointly conducted by the Seoul-published Hankook Ilbo and the Tokyo-based Yomiuri Shimbun on June 22-24 to gauge public opinion in the two countries on the landmark agreement to end the wartime sexual enslavement feud and set up the Reconciliation and Healing Foundation, funded by Japan, to compensate the victims. Calls for renegotiation of the agreement surfaced after South Korea's Moon Jae-in government described the bilateral deal, signed under the previous administration, as "seriously flawed" and decided not to use the Japanese fund worth $9.1 million. In the survey, 91 percent of South Korean respondents said Japan should offer further apology to the "comfort women," a euphemism for victims of sexual slavery by the Japanese military during World War II. But only 14 percent of Japanese respondents said so. Likewise, 73 percent of South Koreans called for renegotiation of the comfort women deal, whereas only 23 percent of Japanese thought it ought to be renegotiated, the poll showed. The continued establishment of comfort women statues in South Korea and the United States was supported by 80 percent of South Koreans and 5 percent of Japanese. 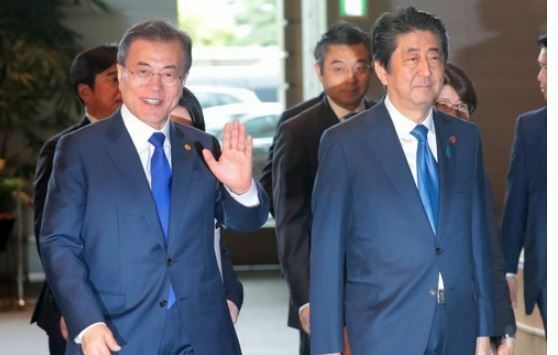 Meanwhile, only 20 percent of South Koreans and 38 percent of Japanese said they can trust each other's country, while 24 percent of South Koreans and 40 percent of Japanese expressed friendly feelings toward the other country, the survey found. The people of the two countries also have strong distrust of each other's leader, with 21 percent of Japanese trusting President Moon and 5 percent of South Koreans trusting Japanese Prime Minister Shinzo Abe.